Monte-Carlo Société des Bains de Mer (“S.B.M.”), world renowned owner and operator of iconic luxury hotels and resorts in the Principality of Monaco, and Galaxy Entertainment Group (“GEG”), one of Asia’s leading developers and operators of world-class, luxury, integrated entertainment and resort facilities, announce today the formal establishment of a strategic partnership. This partnership includes a mutual commitment to enhance the respective businesses and brands of each company and to work together on the development and operation of entertainment businesses including Integrated Resort (“IR”) projects in the Asia-Pacific region. The announcement of this agreement follows a strategic investment made by GEG in S.B.M. in July 2015. On the occasion of a meeting in presence of H.S.H. 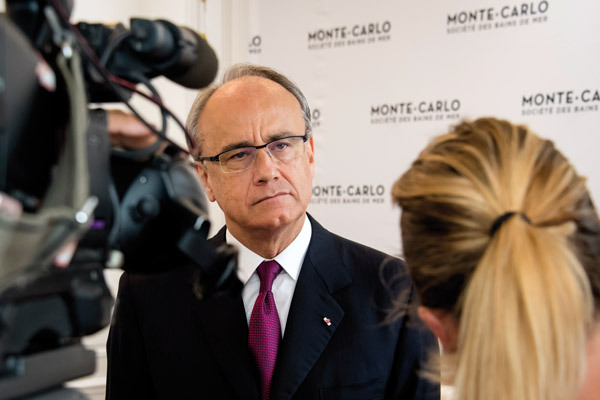 Prince Albert II of Monaco, Dr. Lui Che Woo, Mr. Francis Lui and Mr. Michael Mecca, respectively Chairman, Vice Chairman and President of GEG, Prince Albert II reiterated His full support for the objectives of the Strategic Partnership (signed on July 24th 2015) between Monte-Carlo Société des Bains de Mer (S.B.M.) and Galaxy Entertainment Group (GEG) to work together on several opportunities including future projects throughout the Asia-Pacific region. The announcement by GEG and S.B.M. comes 15 weeks after the Upper House of the Diet in Japan approved the “Bill Promoting Implementation of Specified Integrated Resort Areas” (or the Integrated Resorts Promotion Bill for short) – paving the way for the future introduction of IR’s in the country. Noting the world-class, luxury, integrated resorts that GEG is renowned for in Asia, as well as the iconic, luxury prestige of S.B.M.’s rich history in Monaco, His Excellency Mr. Serge Telle, State Minister of Monaco, during his recent visit to Macau and further to the Sovereign Prince decision, was pleased to confirm the Monaco Government’s endorsement of this strategic partnership – recognizing the potential both companies provide to each other’s business portfolio and brand. Both GEG Chairman, Dr. Lui Che Woo and S.B.M. Chairman of the Board and Chief Executive Officer, Mr. Jean-Luc Biamonti, also reiterated their mutual commitment to their collaborative efforts. Commenting on the strategic partnership, S.B.M. Chairman of the Board and Chief Executive Officer, Mr. Jean-Luc Biamonti said: “We recognize the similarities in corporate philosophy between both S.B.M. and GEG. A deep commitment to supporting the company’s employees and the local community, the environment and maintaining the utmost quality in world-class resort design and service standards, which all echo S.B.M.’s own corporate beliefs. GEG’s success in Asia will certainly be a valuable enhancement to S.B.M.’s portfolio,” he continued. With the recent passage of the Integrated Resort Promotion Bill in Japan in December 2016, both companies look forward to the possibility of collaborative efforts to design, develop and operate an IR in Japan that would offer the best of what both GEG and S.B.M. have to offer.